The USCCB recently released a long anticipated document concerning blogging within the context of Catholicism. The document was sparked by the recent 2008 Catholic Blog Awards and the controversy of a midwest Bishop saying he would deny access to the donut ministry table following mass to anyone who did not vote according to the timeless truths laid out by Christ and His Church guided by the Holy Spirit through the ages in the 2008 Catholic Blog Awards. The Bishop's statements started a heated discussion among theologians from every denomination. They are questioning whether or not the donut ministry falls under the confines of Eucharistic hospitality and if a Bishop actually has the authority to make such a denial. It is being reported that Canon Law is silent on the issue. 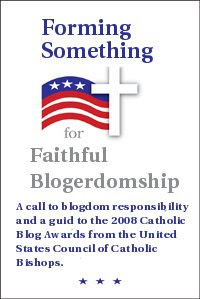 The document, which is called Forming Something for Faithful Blogdomship: A call to blogdom responsibility and a guide to the 2008 Catholic Blog Awards from the United States Council of Catholic Bishops, is an easy read and has section on various church issues involving blogging: What does the Church Teach about Blogging?, Is there Blogging in the Bible?, What Would Jesus Blog? and Do People See God's Face on My Space? The document also includes subsections and tangents on the following: being a prudent blogger, human dignity in the blogosphere, who can participate in blogging, making blogging choices, and solidarity. The Bishops end the document encouraging all Catholics to vote for Alive and Young in this year's Catholic Blog Awards. Failure to vote for A&Y will result in the destruction of the metaphysical dimensions of reality, the tearing apart of the time space continuum (which could be really cool) and the reintroduction of New Coke into America (YUCK). I can't breath I am laughing so hard. Is there a section on meming? Aw man! You beat me to this one! I was going to write on Faithful Citizenship vis a vis CBA. AND sic was wanting to do a donut/Eucharist/GIRM takeoff. Seriously, are you bugging our minds? lgd: Meming have to be a venial sin. I mean, God created a natural moral order to the world. It just makes sense!! !